Westridge Audio AB of Sweden, Production Manager /Technical Director Daniel Rüdén and LD Tobias Borén did great things with HARMAN Martin’s MAC Aura wash light at Sweden’s Summerburst festival in June – and protected them with custom-designed rain covers. Summerburst, held June 7-8 in Gothenburg and June 14-15 in Stockholm, is Sweden’s relatively new but extremely popular 2-day summer dance festival. 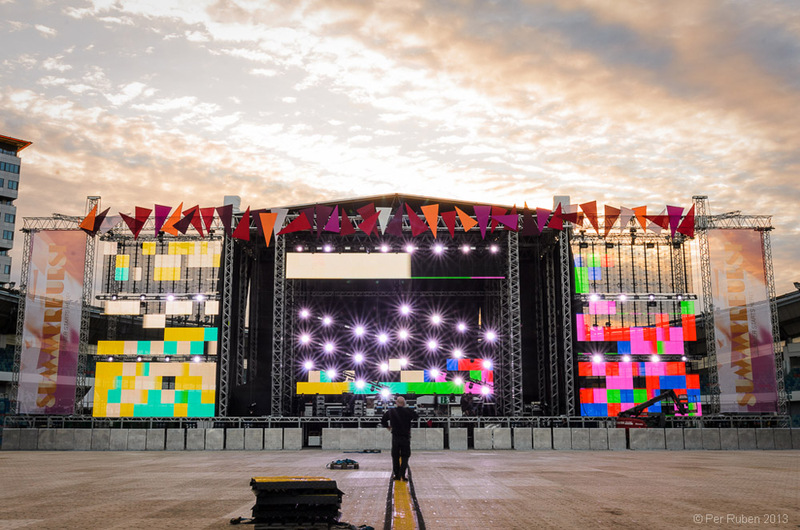 This year, Music & Lights AB supplied Martin MAC Auras™, MAC 301 Washes™ and Atomic 3000™ strobes for both events along with Jem ZR44 Hi-Mass™ foggers for atmospheric effect. Top-name DJs at this year’s Summerburst included David Guetta, Sebastian Ingrosso, Axwell, Steve Angello, Alesso, Steve Aoki, and Hardwell. “The crew and I got a lot of compliments on the design and setup as well as the choice of fixtures,” Daniel says. Because most performances at Summerburst take place while the sun is still up - and even when darkness does fall it is not totally dark - lighting fixtures had to be powerful enough to use in both broad daylight and after sunset. “The MAC Aura really did an amazing job there,” Daniel commented. “The look of the fixtures and lenses themselves are usable during daylight, and when darkness comes the zoomed beam was almost as strong as the [beam fixtures] next to it. Daniel says that they always struggle with weight limitations but with the MAC Aura’s light weight they were able to use more fixtures and still keep the brightness and functionality.